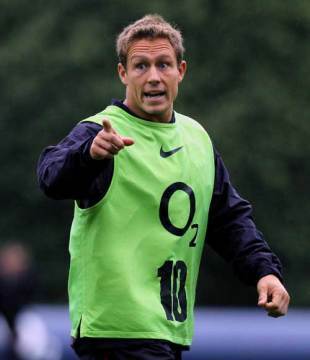 Rob Howley believes that Jonny Wilkinson will have a key role in England's bid for the Six Nations title. Wales assistant coach Howley is currently preparing the side that will take on England at Twickenham on February 6 and has no doubt that the experienced Toulon pivot will be wearing No.10 for their opponents. "He has got world-class basics of the game," said Howley. "He has a mental toughness tougher than many players I played with, and his kicking is second to none - the statistics show that. "He's an integral part of the England set-up. I have no doubt he will be a huge cog with England, and I have no doubt he will start against us." Wales' key selection concern ahead of the game is at scrum-half, with Mike Phillips and Dwayne Peel both out of the squad due to injury. The experienced but out-of-form Gareth Cooper is joined in the squad by Scarlets youngster Martin Roberts and uncapped Blues No.9 Richie Rees. Rees has been in fine form for his region in Europe and is currently keeping Cooper on the bench. "I feel this is my time," he told The Western Mail. "I have waited a long time for the chance. Hopefully I will be given that opportunity and I will take it. There are some quality scrum-halves in Wales and you just have to bide your time, keep doing what you are doing and hopefully the breaks will come your way. "Mike Phillips is probably one of the best scrum-halves in the world at the moment and you just have to look at the quality of Dwayne Peel and the experience he has had. Gareth Cooper came to the Blues this season and he is a good player. But everyone wants to start in their position for their region and that has been my focus."